Beriberi doesn’t cause diarrhoea. Try dysentery. Phil: We’re hard at work on the Kate vs the Navy’s edits thanks to some really superb work from proofreader Catherine Fitzsimons. All the way through the manuscript, Catherine has annotated changes and made suggestions. Working on these is a little like the days of handing your work in to a teacher and seeing what they have written at the bottom of the page. We’d expected little more than a tidy up for the grammar and spelling plus some useful text formatting. What we have is far better. Catherine has read the book and provided all sorts of plotline advice. There are notes about references that appear later in the book, the sort of the things you only know when you have fully grasped the structure of the narrative. To be honest, I think she knows our book better than we do! Along the way there are also technical points such as the sort of illness one of the characters could have suffered in the past, although Candice was glad to have read this AFTER eating her Warwickshire Rarebit lunch (It’s like Welsh, but with local ingredients since you ask). Once you get over the idea that someone has criticised your work, then the process of applying many of the suggestions is great fun. For a start, we have to really think about sections of text, some of which require a bit of head-scratching. However, the result will be far better than we’d have managed on our own and makes the service well worth every penny. Phil: One of the projects I work on has an associated web forum. Users can comment on the publication whether they read it or not as well as discussing many other topics. Sadly, some see this as an opportunity to have a pop at the editorial team with wide ranging statements along the lines of “The last issue was a load of rubbish” or “I want a better magazine”. None of these provides any help producing said better magazine and are just posted to give the writer a little thrill that they’ve bullied someone and can get away with it thanks to being on the web. I’d suggest that they then run off and boast about their cleverness to their friends but I suspect like most trolls, they don’t have any. Being on the receiving end of this kicking, can be very hard indeed. More than once I’ve wondered what the point is and started taking more interest in job adverts. After all, you do your level best and the only response if from some pathetic individual holed up with a computer who gets a thrill from being nasty. Nowadays you can’t avoid this, the only salvation is to realise that you are often looking at one or two individuals who just make a lot of noise. The majority are happy with the results and many do use the opportunity to say so or indulge in helpful discussions, something I really enjoy. What does this have to do with writing our book? Well, we’re working through some publisher comments at the moment. Happily, there is nothing bad and some of them have fired us up to write extra scenes that will enhance the story. This has been great fun and the additions have enriched the text. Others though are more contentious. Taking criticism isn’t easy and there are a couple of suggestions that we aren’t so happy with. Not angry or upset, simply we disagree. Being a writing duo makes this a lot easier – we’ve chatted and agreed with each other that we don’t agree so there is none of the ruminating in the middle of the night wondering if the whole project is all rubbish that can affect the solo author. This is helped by the publisher making it clear that these are just suggestions. When we meet them, we’ll chat over the ones we disagree with. So far, having someone who isn’t as immersed in the book as we are reading and commenting has improved the text and long may this continue. And as you are head for the comments, if you wouldn’t say it face to face, don’t say it on-line. Phil: I’ll be honest that when you see, “I loved this book” Julie Burchill, Mail on Sunday, in the front of a book, it’s probably not for me. On the other hand, it pretty much sums this book up. 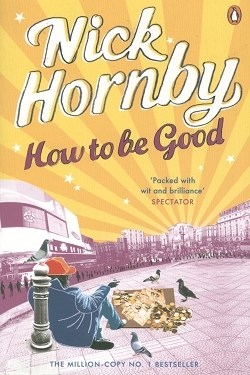 “How to be Good” is a million copy (presumably copies sold, although the odd phrasing makes me wonder) book by Nick Hornby. The plot revolves around London GP Katie Carr who starts the story by telling he husband she wants a divorce. After this, he has an epiphany and transforms from a pain in the backside to over-good. Which annoys Katie. Well, that’s what the back of the book says. I’ll be honest that I got bored and gave up two chapters in. This is unusual for me. I can normally stick it out but this time, no. For a start, I didn’t like or care about any of the characters. Kate is annoyingly smug. Her husband is a wa****r. If they’d died in a head on collision with a rotary snow plough it would have been both a great relief and an excellent opening for an episode of Casualty. Worse, they exist in that special part of London where media types live in a bubble. Everyone earns loads, lives in nice houses, find as much time as they need to hold down a job yet lunch with a wide variety of cliché friends. The job doesn’t have to be the sort of thing that in the real world pays enough to exist in this special world either. Thus, hubby can knock out a weekly opinion column for the local paper and none of the children are sent out to clean chimneys to keep the family afloat. The beauty of setting your story in the London bubble is it will garner plenty of good reviews from critics like Birchill (OK, she live in Brighton but that’s London-on-Sea) who exist in the same world. I bet the café bars of Hoxton were full of people reading this on their iKindles. I just hope the pubs of Solihull are as kind when our book appears. In case you are thinking I should have given the book a bit more of a chance by the way, I did. I read the last 6 pages before abandoning it. With some books you do this and think, I want to know how we got here.”. Not this time. Phil: I’ve been back on the query letter treadmill recently. There has been much trawling through the Writers’ & Artists’ Yearbook looking for agents who aren’t based in London. We’ve nothing against an agent residing in the capital it’s just that we think they may prefer authors from within the M25 and that isn’t us. If anyone wants to prove me wrong, feel free, but when faced with many pages of potential contacts, you’ve got to reduce the list somehow. Anyway, last Saturday I e-mailed off another query complete with letter and fully proof-read first 3 chapters. Later on, while checking my phone in the pub (I was waiting for my mate to come back with his round and looking at your phone says, “I’m not a weirdo loitering for no reason” to anyone who looks your way. Or at least most blokes think it does.) I spotted a reply. Sadly, the reply was a rejection, but a good one. This looks a good read. Sadly, it wouldn’t be quite right for our contacts. 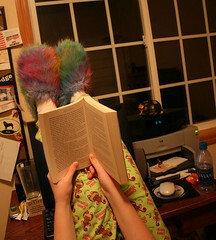 She thinks it looks like A Good Read. All we have even wanted to do is write a good read. We’ve never claimed to be knocking out the sort of complicated literary stuff that gets the hard-core critic excited. We just want to entertain a few people. People who might be sitting beside a pool somewhere or curled up on a sofa with a steaming mug of tea and a slice of cake. It’s important to remain positive as you struggle towards being published, so we’ll take this little morsel and thank the kind person who made both of our days. Win, Lose or Die – Blokelit? 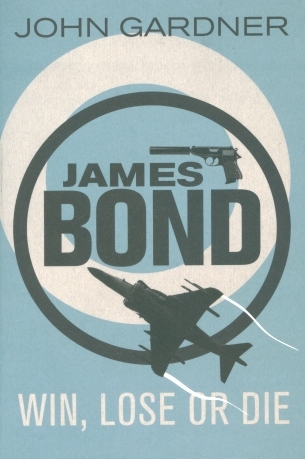 Phil: This post was going to be a review of John Gardner’s James Bond Book Win, Lose or Die. I was going to mention that it’s a sort of blokey chick-lit with war and gun references replacing the shopping and designer brands. It is of course. There’s loads of detail lavished on weapons systems and recalling military manoeuvres in the Falklands war. It all gets in the way of the plot probably proving that ex-military types are less adept at handling this sort of detail than most chick-lit authors. Since I didn’t grow up reading comics featuring war stories were characters would shout, “For you Fritz, the war is over”, I found myself wishing there was less minute detail on the ammunition. Needless to say, I don’t have to do this as it’s pretty much what I said when reviewing another book from the same author just under a year ago. That’s the problem with a long running blog, it’s easy to repeat yourself. Looking at my words, I obviously enjoyed The Man from Brabarossa rather more than Win, Lose or Die. I can understand that because the plot in this one doesn’t stack up. In fact there is a hole big enough to drive a battleship in to. A hole so large, you wonder why no-one thought to mention it before publication. Spoiler Alert: For a chapter or two, Bond is taken off to a US military base for debriefing. Except it isn’t a US base, it’s a fake set up by the bad guys. Later is turns out that MI6 knew he had been sent there, that it was a fake – and didn’t bother to mention any of this to Bond. Had he known, he’d have spotted the dodgy Wren (who readers susssed out about 10 minutes after he met her anyway) and the climax of the story would have never taken place. You could argue that this might have ruined the end of the book but not as much as wondering what they heck M and the rest of Bonds bosses were playing at. That’s not the only plot issue either although this one is possibly more timely nowadays. It seems that nearly everything we say is being recorded both on the telephone and in the street. Computers use voice analysis software to listen for key phrases which prompts experts to listen properly to. This all sounds very like the PRISM listening programme revealed last year by Edward Snowden leaking documents. However, in 1989, I think Gardener was over-egging just how much surveillance was going on. More to the point, why would the bad guys have a slogan they kept repeating which alerted the security services? I know Bond villans are normally a bit thick, after all why do they always reveal their plans instead of just shooting 007, but this takes dumbness to a new level. Phil: As mentioned on Tuesday, we had a bit of a writing sesh last week where The Book received a good reordering. Much of the feedback from test readers mentioned that we have fallen into the newbie trap of taking up too much valuable reader time setting introducing characters and setting up the story. If I’m honest, while the first third is sublime, we don’t really get stuck in to the story. Having expended a lot of effort in short stories and also analysing other peoples books, we realised that you have to pitch the reader straight in and worry about explaining things later. To make matters worse, this the three first chapters that are submitted to agents, the very people you need to grab by the throat with your writing. Some months ago, I had a go at tackling this. Taking a scene midway in the story that only receives a passing mention, I expanded it out with the intention of providing a bit of drama and introducing our main character. The result was (I thought) funny and reasonably dramatic but it didn’t really do it. 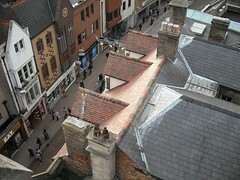 Despite revolving around someone nearly going over the edge* of a roof, we didn’t feel it was right for the opening. My choice of start point was partly influenced by a lack of imagination as to how we got back into the main story afterwards. It’s all very well being dramatic but if you cut straight to the chase, the book ends up ten pages long and no one has a clue what lead up to the denouncement. I grabbed an extra scene that was fun but only introduced one person. It simply didn’t do enough. Candice was braver and picked a different point with someone going over the edge. We don’t do a lot of it, but chucking people from the roof is dramatic and no one can tell me otherwise. By using a single viewpoint we get three main characters introduced quickly and manage to incorporates a mystery element in too. All in just over two pages. Best of all, in our pre-cake rehashing, we worked out how the intro can drop us back in the main story and even use it to make the main character more sympathetic. To be honest, it’s pretty much perfect. By the time we were looking at coloured cupcake, we were in possession of a plan. This is a relief. I’ve been pondering the problem on and off for a while but while I could see the solution, it always seemed in soft focus. A bit like the world before I put my glasses on in the morning. Now I can see it not just with specs on but through recently cleaned lenses. *True fact. As I was typing this, on my iPod the Manic Street Preachers were singing “Suicide is Painless” on random play. How’s that for serendipity?